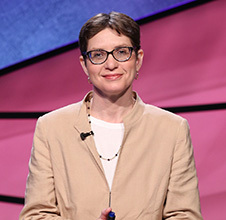 "She was a high-school teacher when she became a five-game champion in season 22. She's still teaching and living in Brooklyn, New York. Please welcome..."
#6810, aired 2014-04-04 Dan Pawson vs. Maria Wenglinsky vs. Keith Whitener Battle of the Decades: The 2000s game 5. #5003, aired 2006-05-17 Michael Falk vs. Jason Richards vs. Maria Wenglinsky 2006 Tournament of Champions semifinal game 3.